WAN-IFRA’s annual World Young Reader Prize competition honors innovative newspapers that have devised the best project or activity to attract young readers. In all, the prizes honored 24 projects all over the world in 2011, with top winners from Brazil, Indonesia, India, Portugal, The Philippines and the United States. Jawa Pos newspaper of Indonesia has been named World Young Reader Newspapers of the Year for 2011, also winning the top prize for enduring excellence. Newspapers often have book donation drives and The Hindu (India) was no different when it organized a huge event that was branded as an opportunity to bring knowledge to those who need it the most. 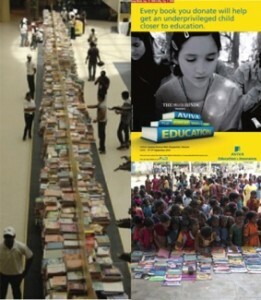 They mobilized both young and old in the city of Chennai, and collected 275,000 old and new books in just five days. Collected books were organized according to age groups and distributed to schools with the help of various non-governmental organizations. One of the most striking ideas in this project was to build a mammoth wall of books in a public venue in order to highlight the endeavor. This effort made for a very good simple but visible PR concept with amazing numbers. We also very much appreciated that those books that could not be used were recycled to make notebooks, ensuring effective use of all donations. The newspaper’s investigation into how companies secretly track children online aimed to educate parents, teens and young children about how companies create detailed profiles of them for marketing and other purposes. The report, published between June and September 2010, included an interactive guide on “How to Control Your Privacy Online.” To attract teen readers, the newspaper described the findings in the Classroom Edition, delivered to nearly 4,500 U.S. high schools. As a consequence, in May 2011, two U.S. Congressmen, a Democrat and a Republican, introduced a draft bill that would prevent the tracking of children without parental consent. The news story, "On the Web, Children Face Intensive Tracking," by Steve Stecklow stimulated newspapers to reach a new level in investigative journalism. It showed that using energy, resources and high-level techniques in reporting about family questions was a good investment for investigative reporting, which should not be only restricted to the ‘big deal’ themes of politics, crime and corruption. The results of such journalistic effort in this field can help society to learn about and abolish harmful practices. The Journal reports that after this report several sites modified their privacy policies and that legislation has been proposed. Bravo!" MediaLab provides students and families with an exciting new dimension in media literacy and brings the world of newspapers to them in an interactive way using modern technologies. The project provides workshops designed to empower students to be critical thinkers and to express their opinions and develop news-writing skills as they produce print and online products using podcasts and video. Launched in November 2010, MediaLab has achieved impressive results in a short time, with 200 students participating daily, well on the way to its targeted 50,000 a year. It is so popular that schools have to book several months in advance. MediaLab is now also offered on weekends for family participation. MediaLab is is located at the headquarters of Diário de Notícias in, Lisbon and targets students aged 10 to 18 years. Access to the online platform is completely free. A professional trainer provides workshops and students also produce podcasts and videos. After the visit, students can develop a school newspaper by using web tool available at MediaLab web platform. Congratulations on being a leader in the field and providing a facility to enable young readers to actively participate in the world of journalism and media using new technologies. The project provides an excellent model for other newspapers to follow and develops an awareness of the importance of news writing and reporting. The simplicity and the scale of this in-house media literacy project are impressive and the ambitious 50,000-student target participants is well on the way to being achieved. The inclusion of families as well as students adds to the reach of this project. Read and Think NIE Project aims to encourage the habit of reading newspapers, promoting the improvement of educational indicators that relate to reading and getting information to the schools, enriching the teaching-learning and preparing children and young people to exercise full citizenship. The development of the Project Read and Think is justified by the alarming rates reported in the national and regional assessments regarding to reading, interpreting and producing texts and logical reasoning. 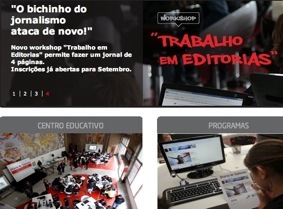 The jury awarded the top NIE prize to Gazeta do POVO Newspaper not only because of its competence as shown in its longstanding “Read and Think” programme, its educational, communication and training project for young readers, but also for its partnership with the universities and its special approach to teachers and students of all grades. The key innovation has been the care and competence in analyzing the recent results of the program, and thus clearly documenting the improved educational skills of students who used newspapers in class as measured by results in the IDEB (Index Basic Education Development), the national exam of Brasilian Education. Your programme can be a model for many countries. The action that sets Gazeta do Povo truly apart is its high-quality NIE programme and the very careful measurement over three years that shows the clearly positive effects on the academic achievement of children of using newspapers in class. 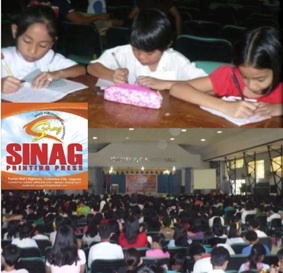 To encourage the young to embrace and develop a love of journalism, the plant regularly offers Sinag Journalism Training Seminars that are free and open anyone, but particularly to students in the region. Participants need provide only their own food and something with which to write. Seminar topics include news and feature writing, opinion writing and cartooning. The sessions are highly popular with an overwhelming 1000 participants at the first edition (now limited to a maximum of 300). This printing plant's journalism seminar activity is clearly a fitting tribute to the person after whom this category is named as the commitment is clear to assuring that youth learn about the importance and fragility of a free press and about how to do good journalism. This prize is named after Natasa Vuckovic Lesendric ( (1966-2011) who, aided by WAN-IFRA and UNESCO, set up an independent distribution and printing plant under the regime of Slobodan Milošević in Serbia. She assured that the printing plant played a role in teaching the young about the importance of the press to democratic freedom. This was a multi-media project aimed at increasing political awareness among youth aged 14-25 years and encouraging them to participate in the local and regional elections to be held in September 2011. Glåmdalen uses cross-media strategies to reach the young and link them to the main paper. Four young students make up the editorial youth group, supervised by a young political editor. 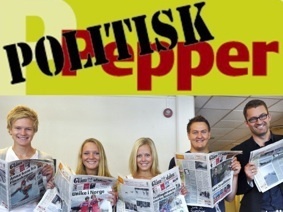 Politisk Pepper is published in paper every Wednesday, with links to an interactive website that includes videos, a blog and a Facebook site. The paper says the project has been so successful that it intends making Politisk Pepper a permanent feature of the newspaper, even after the elections, since adults enjoy it as well. TNS Gallup research shows that Glåmdalen has experienced a 10% increase in young readership, a direct result of the campaign. The paper also received very high ratings from young people in a survey, where it was ranked at the top out of 50 titles. Results showed that one out of three young people in the community participated in the political debate in Politisk Pepper. Politisk Pepper has been carefully conceptualized and well-implemented, with a baseline study conducted prior to the launch of the project and interim research conducted after six months. It will be interesting to see the research findings after the actual elections in September. We really like that the student editorial team is integrated into the main newsroom and attends editorial meetings with the full-time staff. We are impressed that a small regional paper has had so much success in attracting a strong youth following. This project is an interesting example of how introducing a team of young writers into the paper and giving them the freedom and space in the paper to express their youthful perspective on issues can change the entire perception of a newspaper. This project is easy for other newspapers to replicate, even without additional funding. 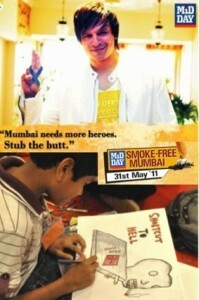 This three-week long multimedia campaign in the cities of Mumbai, Delhi, Bangalore and Pune encouraged young people and their families to kick the smoking habit. Celebrities and organizations joined in the effort, including the cities´ most important corporations. 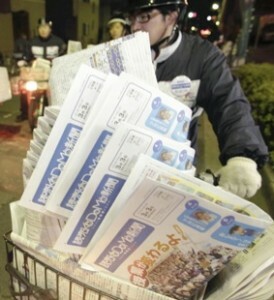 The paper organized street marketing activities and the effort received extensive editorial coverage. Branding was done at various locations, such as cafes and movie theaters. Social media was used effectively, such as SMS's hourly tips to stop smoking. This project was an interesting idea to use a pledge mechanism to promote a tobacco-free lifestyle, with impressive results. The paper involved both young and old in the community and collected support from usually neglected institutions, such as private companies. After the main campaign was completed, MiD DAY continued to remind its readers about the perils of smoking, making it a continuous and long -lasting contribution and connection. The Yomiuri Kodomo Shimbun, a weekly newspaper written for children aged 6-12, joined efforts with the publisher of children’s books to promote reading. Yomiuri and Shogaku-kan wanted to do something to encourage children to read more and launched a weekly publication in March 2011. Shogaku-kan’s experience in producing books and magazines for children was appealing to the Yomiuri, and Shogaku-kan hoped to use the Yomiuri’s marketing power. The goal was 150,000 copies, but because of sales growth Yomiuri had to set a new goal of 200,000 copies by Fall 2011.
in order to revamp readership, the Yomiuri Sigmundso children’s weekly joined forces with another newspaper in a joint effort. The project showed creative solutions, such as choosing seven reporters from the police beat experienced with doing the groundwork needed for a story. Another good initiative was to make a special offer allowing grandparents who subscribe to The Yomiuri Shimbun to purchase subscriptions of the Kodomo Shimbun for their grandchildren. 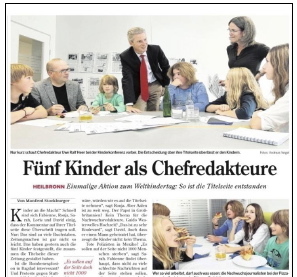 Austria's leading regional newspaper launched an innovative children's weekly with a target group of 6-11 years old. The contents include news, science packages, games and contests. The mission of the weekly includes inspiring children to read and thus helpto improve Austrian children skills in reading and understanding as measured by PISA study. Though well-designed and edited, it was not this weeky's editorial perspective that caught the our greatest admiration. It was the business model that helped the new product to break even in the second month after launch. 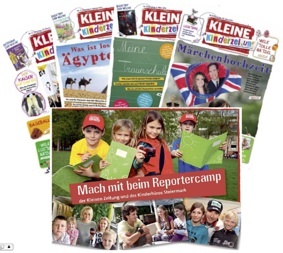 Kleine Kinderzeitung is not a free supplement distributed with the daily newspaper but rather a stand-alone publication sold for an extra price (4,90-6,90 euros per month) just for those who want it. As of May 2011 (five months after its launch) the circulation was 18,000 copies. After watching audiences gather at social media sites like Facebook and Twitter, Delovoy Peterburg, a business daily, followed young adult readers and launched its new news service within a social media site. The platform is not a duplicate of Facebook itself but rather a clone, Vkontakte.ru, that is popular in Russian-speaking countries. The new service is present also on Twitter. DPVkontakte is an online newspaper updated 24/7 by a staff of 5 people and about 200 contributors. It delivers news, slideshows, presentations and video about new media and about doing business in the world. Delovoy Peterburg profits on sales of ads within a service and sponsorships, such as branded sections aimed at a very targeted audience. Within six months the social media newspaper reached 60,000 subscribers and its revenue paid off the initial investment. This Russian newspaper entered the world of social media with Dpvkontakte as soon as it noticed its young adult readership was already there. It successfully translated the concept of a printed newspaper to the connected digital media environment and made traditional websites look old-fashioned. How would children edit a newspaper? Heilbronner Stimme challenged chidren aged 9 to 14 to edit the front page of the newspaper on 20 September 2010, Universal Children's Day. From 200 participating schools, a five-member editorial team was selected in August and after a rehearsal, the project went live on September 19. The junior editorial team’s selection was published on the front page while the newspaper’s professional editorial team’s front page was moved to page 3. One newspaper carrying two front pages, including one selected by children, was a powerful story in itself. The public also joined in, by responding to a survey asking which front page they preferred. Surprisingly, a majority of respondents preferred the children’s front page. This was a powerful idea in letting students edit their own front page – always a revealing experience and a great way to acknowledge Universal Children’s Day. The newspaper should be commended for its pioneering approach in giving children a voice in deciding the news. What really made a difference was giving readers the opportunity to decide which front-page version they preferred, a great reality check for the newsroom and a reflection of the company’s pioneering approach. The main objective of the HOY school competition was to promote reading and journalism amongst children and young people. The competition challenged students to create a digital newspaper, publishing their own newspaper with contents about their school, and or district. The project targeted students aged 12 to 16 years with students working in teams of 5 to 6 students. Students were required to seek out news stories, as well as interview and photograph subjects. The project was funded by sponsorship and included brand merchandising in its promotion. The project was implemented across the Vocento Group and as a result, 5,200 children enrolled in Spain and more than 380 in Argentina, Chile, Ecuador, Guatemala, Peru, Colombia, El Salvador, Nicaragua, Mexico and Venezuela. Registration and publication it also drives traffic to the website. Although in its eighth year, the project has reinvented itself by turning to a digital edition, the planning and implementation of which was very comprehensive. The project provides a concept that is transferable worldwide. 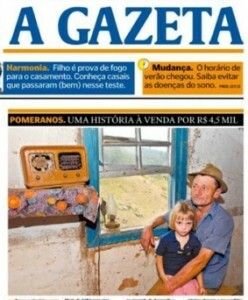 A Gazeta (Brazil, circulation 24,000 daily M-F; 40,500 on Saturday; 51,700 on Sunday) for the Home Sweet Home historic presevation effort. This project effectively showed how an NIE partnership between a newspaper and schools can yield an intense social mobilization and new consideration of a culture. Inspired by the publication of a story about the fate of houses of Pomerisch immigrants, two teachers applied activities they had learned at an NIE workshop to stimulate students to think about their architectural culture and avoid its disappearance. The main objective was to help children and the community recognize the value of Santa Maria de Jetibá’s historical and cultural heritage and also to sensitize them about situation of Pomerisch homes while showing them the importance of preservation. A Gazeta’s Newspapers in Education training paid off as two teachers in the programme used those strategies and techniques to turn a news story about the loss of historic houses into a project to help save them. Heritage preservation is an important issue in Hong Kong because many areas are being redeveloped and buildings torn down. 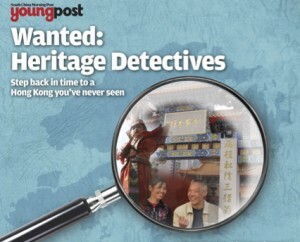 The newspaper partnered with the Hong Kong Heritage Project and the HK Heritage Museum to implement a project that would enable secondary school students to connect with their city’s history. Students were asked to engage with elderly members of their community and interview them about the past. They formed groups consisting of a team leader, a writer and photographer and each group registered formally in order to pitch their story ideas to the paper. Students attended a briefing workshop and had just two months to interview the elderly and work on their projects. The workshops included sessions on interview techniques, oral history tradition, how to find a good story idea and good sources, and how to take effective portrait photographs. A total of 44 teams registered, 70 students participated in the workshop and 30 entries were submitted, ranging from multimedia projects to articles and audio clips. The editor selected the best six stories and these were published as cover stories in Young Post over a six-week period. This project was a great way to get young people with a heavy academic workload out of the classroom and into their communities to find out about their heritage. It provided an opportunity to practice skills they do not normally have the chance to hone at school and the teams participated with no incentive other than to find out more about their heritage and get their stories published in the paper. We really liked the idea of assigning young reporters to gather their own information. Encouraging students to create teams is an excellent idea that makes them more willing to participate and is likely to provide better results on average, moreso than, say, a writing competition focused on individual authors. Young people were able to interact with their elders from a different perspective and learned they have important lessons to gain from the older generation. It also helped them to understand the importance of heritage preservation and to respect the history of their city. 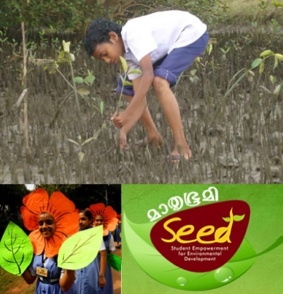 The three-year-old SEED project, which is endorsed by the Department of Education, aimed to creating awareness among 10- to 17-year-olds about the importance of protecting and preserving the environment. Its secondary intention was to develop good reading habits in young people and familiarize them with Mathrubhumi's brand. In its first year SEED had 3,087 member schools, which increased by more than 2,000 schools in 2010, bringing the total number of participating schools to over 5,000. A team of 65 staff members, from factory workers to senior managers, all with a passion for environmental conservation, trained teachers from each education district. The teachers then worked with their students to set up SEED clubs and carry out a wide range of activities, including planting saplings, energy conservation, recycling & making posters. Last year cash prizes amounting to a total of Rs. 20 lakhs (approx. US $ 45,000) were distributed to winning schools, students and teachers. Local environmental reports from schools were published in local editions of the paper, which helped focus public attention on the various problems raised. Detailed stories and editorials were also written about prize-winning schools, which inspired other schools to join and led students to begin implementing SEED programmes at home. This massive environmental project with huge investment from the newspaper and its partners deserved special recognition based on the sheer numbers involved – impressive indeed! It was fantastic that so many people from within the publishing organisation were involved in the project in a really hands-on way, giving of their time and expertise because they believed in the cause. We are sure this project has gone a long way toward improving employee relations within the organization as staff from various levels and departments worked together as volunteers for its success. This concept is something that can be replicated by other newspapers to build team spirit and a common goal for the greater good. Kompas MuDa challenged high school and college students, aged between 15 and 22, in eight cities to create a library and reading garden in an interesting unused space. Together with three sponsors, the newspaper donated 1,000 children’s books to the project and set up a Twitter site, a Facebook page and an interactive website for the project. The volunteers conducted a survey to find a target location that really deserved a library, converted a suitable space, found out how to run a library; and came up with creative activities for the programme. The volunteers (between 20 and 30 per city) created libraries inside schools, in poor neighbourhoods and even inside a museum. Some of the activities they introduced included a literary seminar, a reading day, book workshops and a field trip to the museum. According to the paper, readership of its e-paper by 15- to 25-year-olds increased as a result, although no actual figures were given. This project is commendable because Kompas has created awareness amongst its young readers of the importance of reading from an early age. 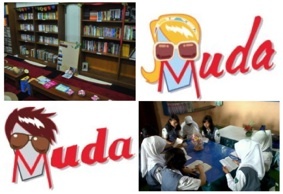 Kompas MuDa has made books accessible in communities where there previously were not. 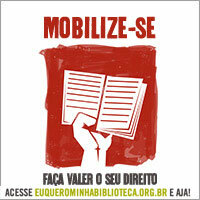 The project could be extended or replicated at a very low cost with donated books. Creating libraries in spaces where you don’t expect to find them, such as in a park, is simply a great idea that gives the message that you can find books everywhere. While it will take commitment and perseverance from the young volunteers to sustain the libraries, the project should be recognized for actively promoting reading and involving Kompas MuDa’s young readers in doing something valuable and of service to their communities. More than 40,000 persons rode their bicycles across 12 cities of India for 14 kilometers, to celebrate the spirit of fun, freedom and fitness in an eco-friendly way. Marketing included both conventional and unconventional methods, such as taking bikes to businesses and giving employees a framed picture with the bikes. Editorial tie-ins included a celebrity and biker´s column, plus extensive coverage of the event. Merchandising was also branded and distributed while a multimedia campaign was also included to spread the word. Bikeathon was sponsored by a main company, plus other secondary gift bearers. 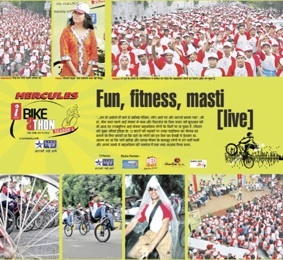 With excellent pre-event publicity, the Bikeathon took place in 12 cities simultaneously. It allowed the newspaper to connect with its young audience both with its editorial content and the main biking event itself. This was a clever idea with impressive results that promoted health-consciousness and fitness by a newspaper with an impressive history of innovation. 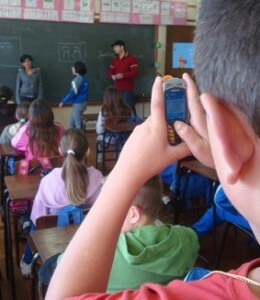 Jornal da Manhã ran a workshop in which students could use mobile phones to learn about the basics of photojournalism as part of its programme to help schools make educational use of mobile telephones that also includes a guide for teachers on now to use other common cellphone features for schoolwork. This uncomplicated idea could be used anywhere to teach the young about the very important tenets of photojournalism in a fun, accessible way. 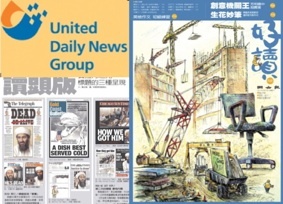 United Daily News, one of Taiwan’s largest newspapers, has for the last two years published a weekly 20-page publication for students called that combines professional editorial content with stories, columns, and artwork from students and teachers. Each issue of UDN Student Weekly includes news literacy lessons and articles from Scientific American and other adult publications rewritten in Chinese for a student audience. UDN hosts weekly competitions for students to submit columns, articles, and cover art. The newspaper works closely with local schools and teachers to develop content for the classroom and includes content created by teachers alongside that by students. UDN Student Weekly is a wonderful example of applying innovative thinking to a common idea. The publication stood out for its content and its persistent focus on education and its efforts to create an indispensable educational resource for teachers and parents. UDN has found the elusive balance between professional and user-created content, mixing its journalists’ original work with international stories rewritten for young audiences, and with articles written by students and teachers. Each issue includes news literacy content designed to help students learn to navigate news media, and “clinics” by teachers aimed at helping students improve their writing. These efforts have paid dividends: the Student Weekly was profitable by its second year, and more than half of Taiwan's school districts subscribe, the first time the Taiwanese school system has purchased group news subscriptions. This success speaks to the strength and potential of UDN’s model for publications around the world. For several years, The Chicago Tribune has published The Mash, a multiplatform publication for and by Chicago-area teenagers. 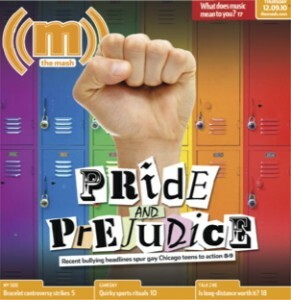 The Mash distributes 75,000 copies of its printed magazine to area high schools every week during the school year. The print edition is complemented by content and contests online and through social media. The Mash pays teams of student journalists to develop and produce content, and features a blend of serious topics, such as the death of Osama bin Laden, as well as cultural topics, and readership and brand competitions, such as a massive prom promotion that received tens of thousands of local teen participants. The Mash is an impressive multiplatform, teen-focused standalone brand that has developed a rare, successful mix of local and national, entertaining and serious content. In its three years on the market, The Mash has grown its reach to 75,000 printed copies and many more online visitors, and is present across the immense Chicago metropolitan region, including in local schools. The judges were particularly impressed by The Mash’s dedication to its student editorial staff. Though professional journalists support the publication, they do not control its content. This has resulted in an encouraging content package that has produced impressive work on serious topics affecting area teenagers. The Mash’s approach, its local reach, and its support from The Chicago Tribune are all models for other newspapers to examine and emulate. 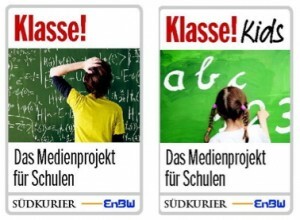 For the past 12 years, Germany's daily Sudkurier has operated a media literacy and news-in-schools program called Klasse! For four weeks every school year, more than 9,000 students receive free copies of the full newspaper. Their teachers receive detailed teaching materials and lesson plans, developed in collaboration with local education officials. Through the lessons, students learn how to read, analyze, and use the newspaper, and learn about broader issues with internet and the media. Newspaper editors visit each school, where they present about newspapers and participate in activities. At the end of the curriculum, students produce class newspaper pages, which are submitted to the Sudkurier staff for evaluation; the best pages win a prize. Klasse! is a news-in-schools program that has succeeded in scale, substance, and sustainability. More than 150,000 students have participated over the program’s twelve years in operation, creating more than 600 student newspapers and involving thousands of teachers and classrooms across southern Germany. The judges were particularly impressed by the program’s focus on broader media literacy, helping students navigate media content and become lifelong readers. The project’s detailed educational materials, close working relationships with its education partners, and long-lasting success make it an impressive model for newspapers worldwide. This project was devoted to the 65th anniversary of the Great Patriotic War victory. This simple concept was effective in making history alive by capturing stories of war veterans. The newspaper worked with children aged 7 to 18 years and provided them with a list of 14 topics with questions. Students had to interview a veteran and submit the material, including a picture electronically. 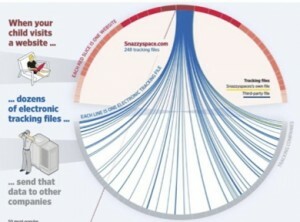 The newspapers editorial team selected extracts and designers developed infographics for each entry. Full copy of the interviews was online and in the newspaper. To celebrate the event, organizers held a public ceremony for the newspaper, students and veterans. 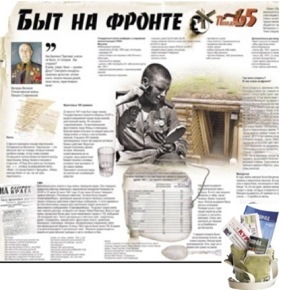 The focus on the "Great Patriotic War" is an interesting example of cooperation between schools and a newspaper that creates bridges between generations, with young people continuing to visit the veterans. It is a great concept to develop a living history project, deftly executed with excellent layout and graphics. By speaking with veterans and publishing an extract from each as an infographic, the project maintained the interest of all readers. This is an excellent project for other newspapers to replicate. For a small paper it was a compelling way to join the community together by talking about local events. Junior Media is an innovative project that encourages students to read newspapers and delivers schools the tool to create them on the template of a professional newspaper. Journalists from all over the country give specialist advice and help children fulfill the dream of becoming a journalist. The success of the program speaks for itself. It was forecast that 200 schools would register in the first two months, but there were 900 registrations. It was expected that 50 school newspapers would be submitted but 900 were received. The special online platform helps students create a newspaper step-by-step using templates of real regional newspapers. Each month 50 of the best newspapers created on the Junior Media platform are printed by the newspaper at their plant in proper newspaper format. During November and December 2010, a total 250 of these newspapers were printed. About 3,000 pupils have received training from journalists so far and over 10,000 students use the Internet platform every day. This is a well-executed project and has good results. It is a good example of how the newspaper can cooperate with its partners. Not only did the paper provide an online platform for its young readers but it also printed copies. This was a very impressive commitment by a newspaper to produce school newspapers online - 1200 newspapers were produced, 200 titles printed and 50,000 copies distributed; 3,000 students trained; 10,000 kid internet users and a projected 1 million readers reached. It is an excellent variation on related work by an earlier winner, Ekstra-Bladet of Denmark. Former WAN-IFRA president Jayme Sirotsky greets the jury. Former WAN-IFRA President, Jayme Sirotsky, greets the jury. Key members of the World Young Reader Prize jury come from papers that have won multiple young reader prizes and continue to keep the young at the center of their work, even though they can no longer compete for a WAN-IFRA award. Previous World Young Reader Prize winners on the jury included: Lynne Cahill of The West Australian (Australia), Altair Nobre of Zero Hora (Brazil), Wendy Tribaldos of La Prensa (Panama), Grzgorz Piechota of Gazeta Wyborcza (Poland) and Lisa Blakeway of EISH (South Africa). Zero Hora newspaper, Ângela Ravazzolo and Mariana Müller. Zero Hora hosted deliberations at its headquarters in Porto Alegre, Brazil. Vote totals discounted those of judges for entries from their own countries. 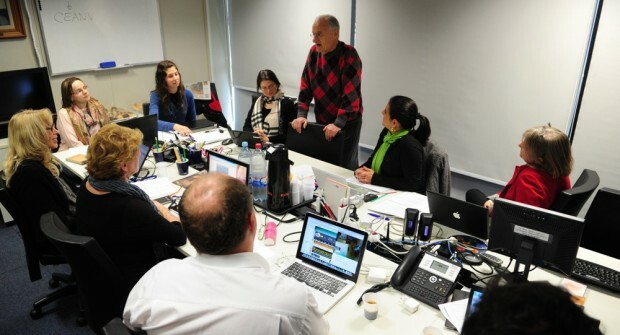 Zero Hora (Porto Alegre, Brazil), a multiple World Young Reader Prize winning newspaper, hosted judges, in the first time deliberations held outside WAN-IFRA’s Paris offices. The paper is now working to give its highly successful youth brand, Kzuka, a national presence. Lynne Cahill of Australia won a top prize this year from the International News Marketing Association for a deceptively simple idea that produced huge gains in newspaper orders from schools: a special supplement of holiday songs with art by students. Wendy Tribaldos of Panama will launch a major, national folklore project in partnership with of The Smithsonian. Activities include the production of the country's first archive of regional dances and costume. Lisa Blakeway of South Africa, a multiple winner while with Johnnic Publishing, is launching a new youth project that combines video, smart phones and learning journalism in cooperation with the European Journalism Centre.